With the compassion of a pastor, the heart of a storyteller, and the joy of one who has seen what God can do, Max explores the story of Joseph and the truth of Genesis 50:20. What Satan intends for evil, God redeems for good. You'll get through this. It won't be painless. It won't be quick. But God will use this mess for good. Don't be foolish or naive. But don't despair either. With God's help, you'll get through this. You fear you won't make it through. We all do. We fear that the depression will never lift, the yelling will never stop, the pain will never leave. 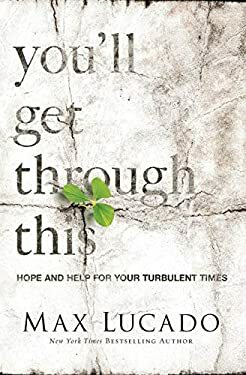 In the pits, surrounded by steep walls and aching reminders, we wonder: Will this gray sky ever brighten This load ever lighten In You'll Get Through This , pastor and New York Times best-selling author, Max Lucado offers sweet assurance. "Deliverance is to the Bible what jazz music is to Mardi Gras: bold, brassy, and everywhere." Max reminds readers God doesn't promise that getting through trials will be quick or painless. It wasn't for Joseph-tossed in a pit by his brothers, sold into slavery, wrongfully imprisoned, forgotten and dismissed-but his Old Testament story is in the Bible for this reason: to teach us to trust God to trump evil. With the compassion of a pastor, the heart of a storyteller, and the joy of one who has seen what God can do, Max explores the story of Joseph and the truth of Genesis 50:20. What Satan intends for evil, God redeems for good. New (115 available) BRAND NEW. Over 1.5 million happy customers. 100% money-back guarantee. Make your purchase count: support Better World Books' worldwide literacy partners.